If you aren’t sure what classy keto dish to serve at your next luncheon with close friends, then let us give you a little clue: there are no finger sandwiches involved, but there is a fabulous lemon and dill dressing. This salad is a sophisticated step up from a Cobb salad, so get ready to put on a show, or at least to make a stupendous impression. It may appear complex, yet it takes only about 20 minutes to prepare. No fuss, and lots of compliments. Just run with it and graciously accept the praise. You can also be proud of yourself for serving a delicious and nutritious meal, after all there is fresh cucumber, green onions, a bunch of baby spinach and a boiled egg per plate. The mushrooms (Portobello, button, crimini, oysters or shiitake) work their magic by helping to protect your health via their proteins, minerals, amino acids and antioxidants. Never underestimate the power of a mushroom – and when they are combined with baby spinach, watch out world! The best chefs know that mushrooms and spinach are meant to be together, just one bite and you will believe that to be true as well. Dried cranberries are entirely optional, just keep in mind, you will want to read the label for the sugar content, so as not to increase your daily carb intake. With the meal over, you can start planning your next get-together with baked lemon-garlic salmon and asparagus on the menu. Add the mushrooms and cook until soft, about 5 to 8 minutes, season to taste and set aside. In a small bowl combine the olive oil, vinegar, lemon juice, dill, salt and pepper. 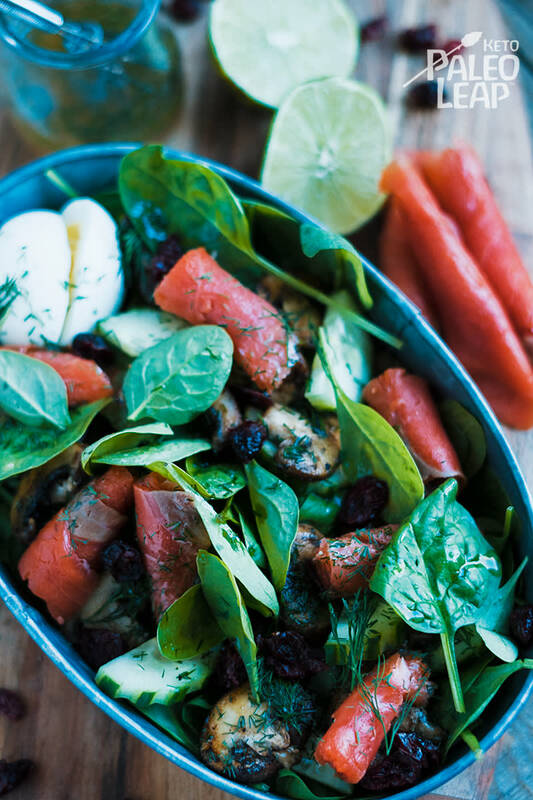 In salad bowl toss the mushrooms, cucumber, green onions, cranberries, and spinach together. Add the boiled eggs and smoked salmon, then drizzle with the dill vinaigrette.